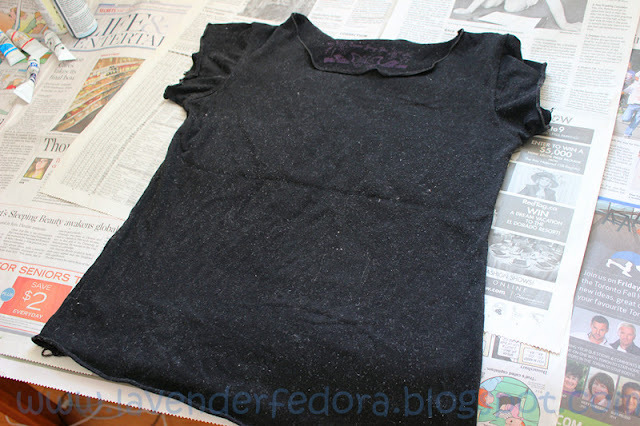 All you need is a simple black T, or any dark colored clothing item that you want to DIY. Of course, you’ll need some paint. I had some old bright blue acrylic paint laying around and I went ahead to Dollar Store and purchased a bottle of purple paint. I also had tons of black and white paint left from my DIY Striped Jeans (HERE), so I made use of them as well. Have some sponges and brushes ready to create your masterpiece. Lastly, grab some multicolored glitter from your local dollar store. 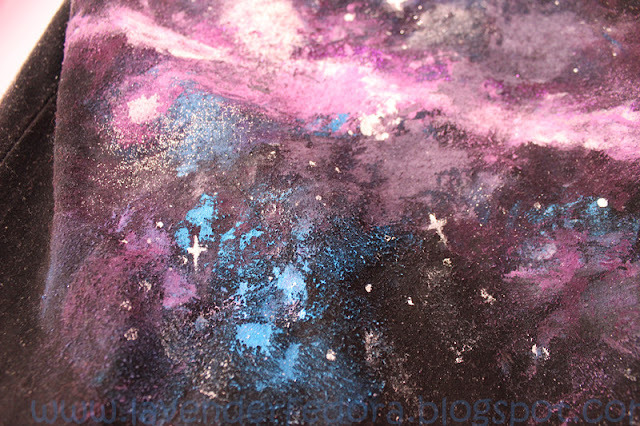 I used silver and purple. Now we’re all ready! Tip no.1, always have a picture of galaxy ready in front of you. I just googled one and used it as an example. You don’t have to make your print exactly like the photo, but it’s always helpful to have one example there so you have the general idea. Of course, you can always create your own design. It’s completely up to you. 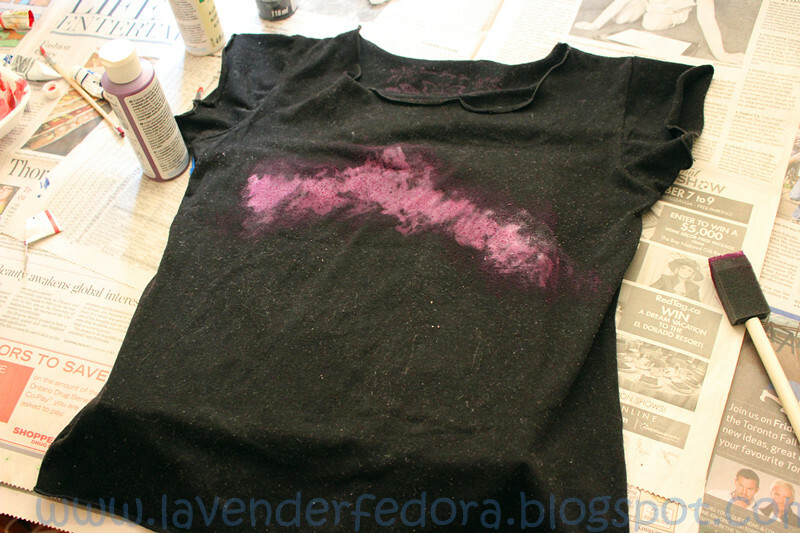 Then, just grab your sponge and dip into purple paint and sponge it on. 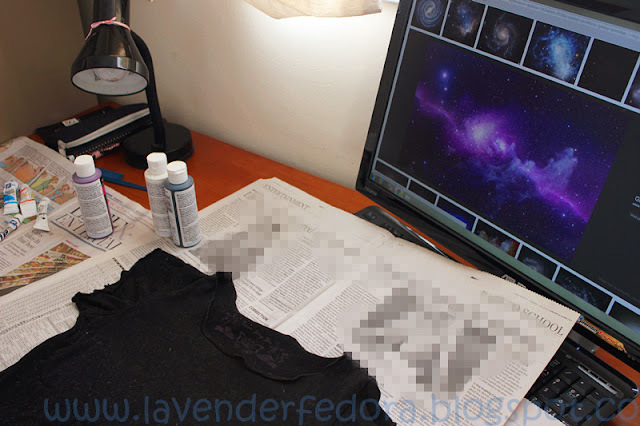 I like to use purple as a base and later on I would blend in white and blue so it has the blurred effect. 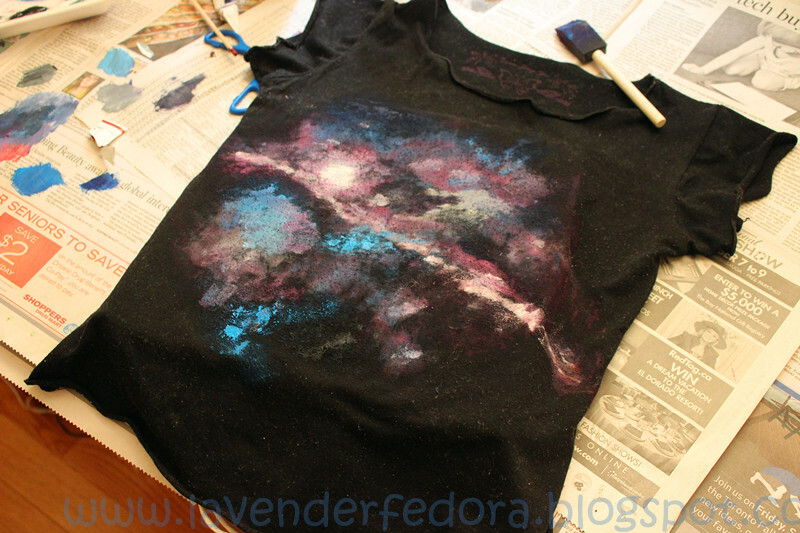 Tip no.2 Put some sort of card board inside of your shirt so the paint wouldn’t soak through it. 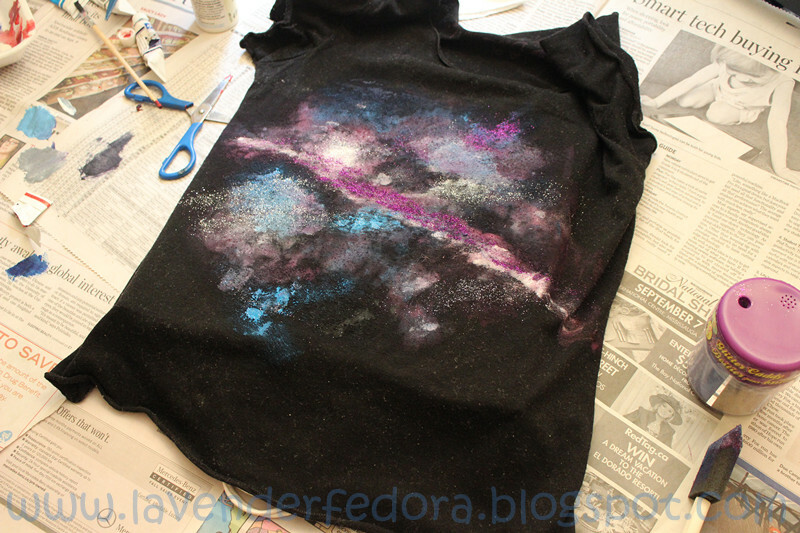 You’ll probably need more than one coat of paint since lighter colors don’t show up very well on black shirt. 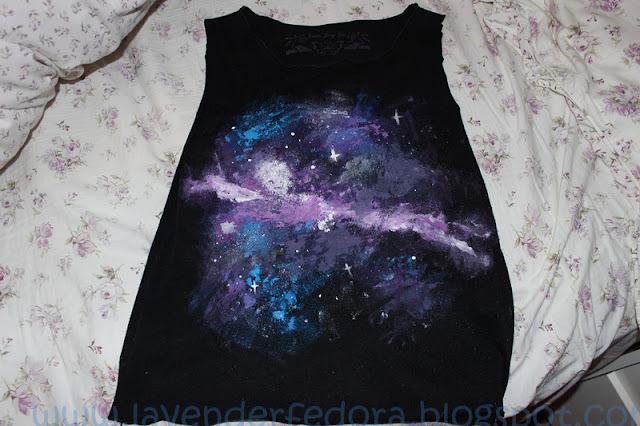 Just get creative and follow your example picture as a guide to create your own galaxy design. 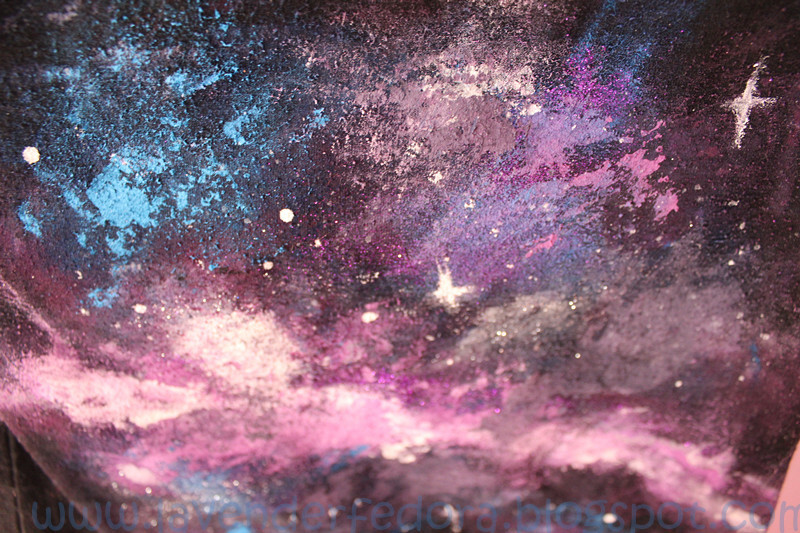 The thing I love about galaxy print is that it’s so forgiving. There’s no particular shape or color to it, the messier, the prettier. Once you get the base color done and if you’re quite happy with your design, just add some finishing touches. 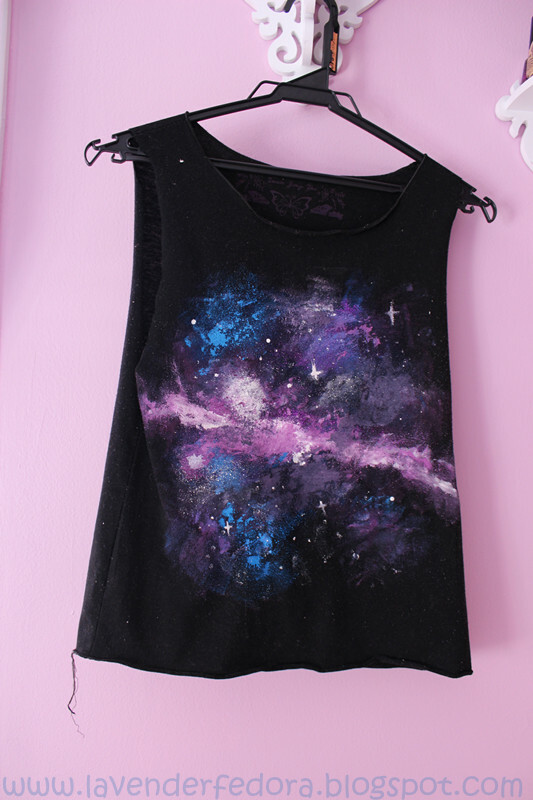 I used a skinny brush to paint on some stars and randomly splattered some white paint over the shirt so it looks like clusters of stars. Those finishing touches really bring the whole look together. Lastly, sprinkle some glitter over the stars or wherever you feel like it. By now, I’m sure you’re already happy with your design. Wait a couple of days for it to dry and wear it out proudly. When someone asks you where you get the shirt and I assure you someone will ask, tell them proudly that you make it! I’m sure they’ll be in awe of your talent when in fact, it was such a simple and fun process. This is such a cool project. Thanks for visiting my blog and for the award! It means a lot! No problem hun, you totally deserve it! oh wow this is such a cool diy, love it! Such a fun DIY! Definitely need to try it out! Catching up on your posts since I've been out of town and this is by far one of my favorite DIY's of yours. The end result turned out so pretty! If you make another one, you can even add some rhinestones or the flat back Swarovski crystals to the center of the stars for even more sparkle.